Nothing at all complex about setting this puzzle, but I’m happy to provide a setter’s blog. 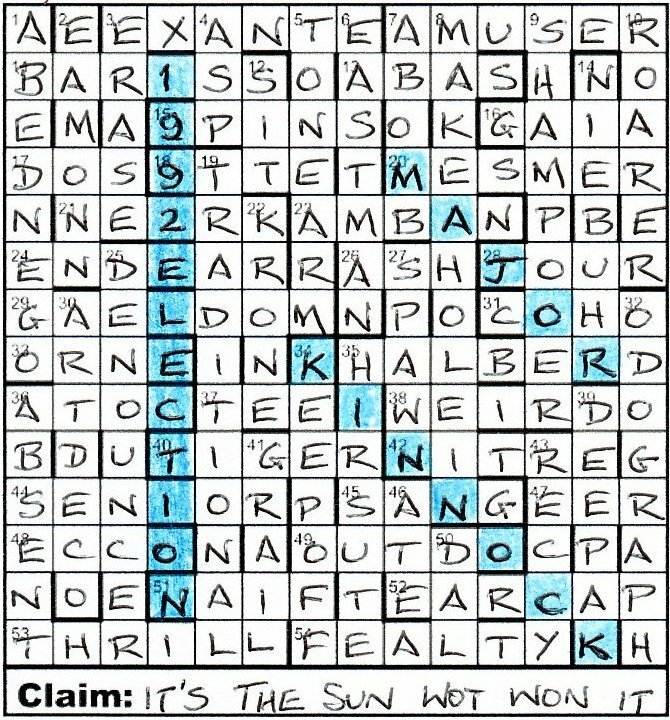 I thought it might be a nice idea to plan a puzzle around what is a pretty famous newspaper headline: IT’S THE SUN WOT WON IT. This appeared after the 1992 Election when the Conservatives won, unexpectedly so since Labour had been predicted to win right up to polling day. Especially because of the unconventional spelling, it was essential that solvers should be able to track the quote down. It was brilliant therefore to find it was in every edition of the ODQ since the headline was written. I had in mind from the start using a ‘numbers for words’ substitution to give ‘1992 election’ in the grid. I then tried to put the quote in the grid itself for the solver to highlight along with ‘1992 election’. This proved extremely difficult but I eventually made it with the I (2nd last letter of the quote) crossing the I (6th letter of election) with its path through diagonals. It would be very important, especially in a puzzle like the Listener where solving records are kept, that highlighting would be unambiguous. While the quote was all there, I thought it would require quite a complex preamble to ensure this. This was further complicated by the fact that the two parts to be highlighted crossed. In particular, the solver would have had to be told in some way that the T in election (which adjoined the I) was NOT the (final) T in the headline. So I abandoned that idea for the one that finally appeared, ie extra letters in the wordplay for 17 clues giving the quote which solvers were to write below the grid. I then decided to put MAJOR and KINNOCK in the grid to give 24 cells in all to highlight. MAJOR was put above KINNOCK to symbolise the outcome of the election. The trickiest part of constructing the grid was to find suitable answers for those entries where words were to be changed to numbers. This was particularly hard as the four cells were adjoining and they could not be left unchecked. I aimed to find answers where the letters did not mean those numbers, ie I was looking for answers where the letters in the number appeared together just by coincidence. In the end I managed that with three of the four, barONEss, neTWOrk, NINEtte, with the other being NINEpins. Only when these answers had been settled, did I try to construct the rest of the grid while the part where the numbers were remained unchanged. All that remained then was to write clues. Two test solving volunteers independently tackled the puzzle and both made invaluable suggestions – many thanks to them. When the puzzle was finally ready for submission, I noted that the 20th anniversary of the headline was in April 2012. In its previous preparation, date had not been a factor. So in my covering note to the Listener editors, I mentioned that April 2012 might be an appropriate date, while saying that the puzzle had nothing to do with the Titanic. Many thanks to them for publishing it on what was very close to the 20th anniversary. What a lovely concise preamble even if it did have those ‘extra letters’ in the wordplay of seventeen clues. It is more difficult, isn’t it, when the extra letters are only in some of the clues? I will admit now that we had already spotted KINNOCK and ELECTION when we finally saw where those letters were leading. I’m leaping to the end of our solve – but, in a way, we did. After two weeks of fairly challenging clues, Raich’s Claim was a welcome gentle romp. In fact, Numpty No 2 was solving so fast and furiously that I was kept busy simply writing and checking the solutions as they came along. That’s a good thing, too, as I had never heard of NIEBUHR, ‘Theologian misrepresented “Burn in hell”? Lines cut (7)’ Clearly we had an extra N here as well as the lines the clue told us to remove. DEEPAK was not a familiar name to me either, but it fitted the clue, ‘Indian guy went up and stripped oaks (6)’ So he ‘peed’ upwards as well as removing the O and S from [o]AK[s]. That final K was the gift that led me to spot KINNOCK, and, of course, ELECTION (with four peculiar unches) appeared at once. We should have immediately hunted for the J of Major, but there has to be a numpty red herring and I searched vainly for a while for the Iron Lady – but ‘No No No’ – no sign of Mrs Thatcher. Of course, though, there was the usual Oenophilic Listener setter tipple in what I thought was the most complex clue ‘A gin meld without Collins penning left-hand player’s part’ (7, 2 words). I had submitted my entry with a putative TONE ARM in it, when a friend explained to me that this was TOM (Collins) penning, or surrounding NEAR (which is the left hand). I learn something with every Listener solve! Mr Major duly appeared and suddenly we were in 1992 election country and memories were stirred. Wasn’t that the election when true blues were predicting ‘bodies in the streets’ if the Welsh gentleman won and wasn’t there that famous Sun headline ‘Will the last person to leave the country please turn out the lights!’ What dirty tricks, indeed. Of course, IT’S THE SUN WOT WON IT! We had to work backwards to find the U of SUN in the NZ bird clue, ‘NZ bird by tent – one that’s flashy and unrefined (5). There wasn’t a ROGER joke this week, not a Kea but a T[U]I next to GER. Now how slow can the numpties be? We had BARONESS, NINEPINS, NINETTE and NETWORK as our solutions to those four top corner clues and the helpful prompt that ‘Numbers in brackets are the lengths of grid entries’. Rule NUMBER ONE (Read the preamble!) but did we instantly put two and two together (and make 1992)? We were puzzled and tried to remember whether it was called the SHAM, EURO, FAKE or WHAT? election. We remembered that we would probably have had a Scot, John Smith, as our Prime Minister, had he not unfortunately died shortly before – but no banana. We had to break for dinner before that lovely little final twist made sense. Oh the joy of the Listener pdm! Many thanks, Raich. This was a very fair and enjoyable crossword. A Raich puzzle this week, so we were assured of a good, solid puzzle and hopefully a nice PDM at the end, perhaps of a Titanic nature. Raich’s last Listener was Les Six and was all about the presidents of the Fifth Republic. 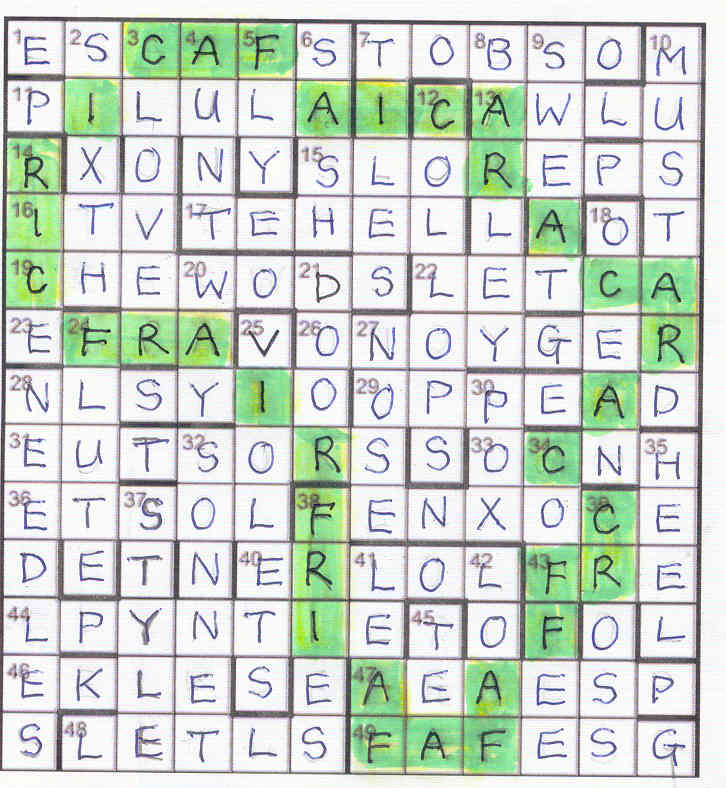 A 14×14 grid, and 58 clues, 17 of which had an extra letter not to be entered. These would spell out something to be written in the space below the grid captioned Claim. Then a contest and two protagonists to highlight. What could be simpler? A positive stampede tthrough the clues this week, made relatively easy by over forty of them being normal, ie unaffected by extra letters in the wordplay. I managed to solve over twenty in the first half hour. Even pencilling 32dn ODOMETER didn’t hold me up for too long, and I soon managed to rationalise it as ODOGRAPH. I then slowed down significantly. This was primarily because I didn’t highlight the bit in the preamble that said “Numbers in brackets are the length of grid entries”. This should have alerted me to the problems I was having with the four sneaky clues in the top left. I suppose one rule to adopt if things are going a bit slowly is to reread the preamble, and I eventually did this. After that, BARONESS, NINEPINS and NETWORK fell into place, and my suspicions of a Titanic theme seemed to be confirmed, with 19•2 near the top of column 4. Well, a few clues later, and I found that we weren’t back in 1912, but much more recently in 1992. There in column 4 was 1992 ELECTION, and one of the great surprises of recent British politics. This meant, of course, that the two protagonists were winner John MAJOR and loser Neil KINNOCK, to be found in a couple of NW-SE diagonals. 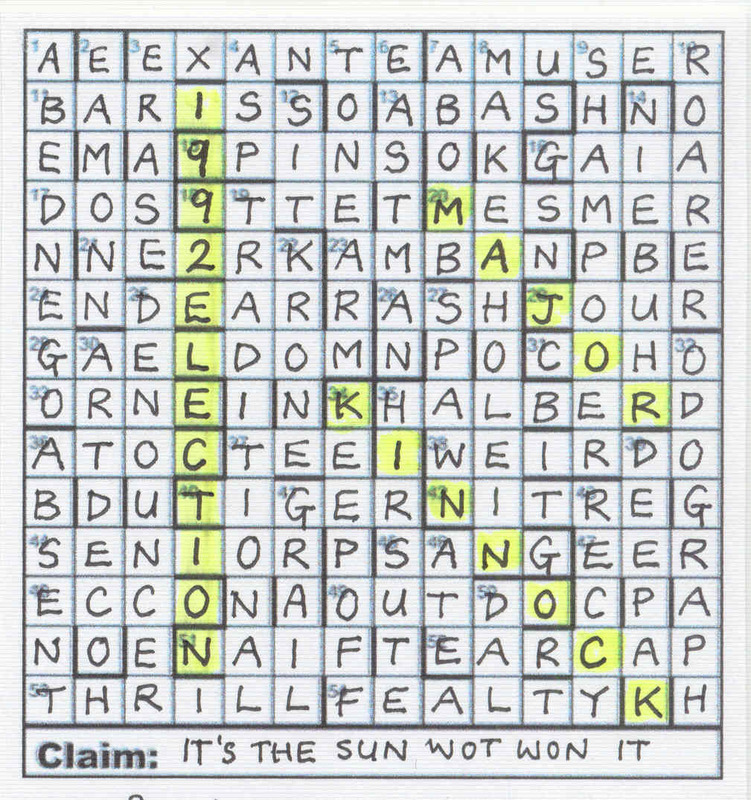 It seemed strange that we just had to enter the extra wordplay letters under the grid, exactly as they were spelt out in clue order It’s The Sun wot won it. No special intuitive leap required there (thank goodness). The other Sun headline, which I think was even more well known, was the one on the day of the election: “If Kinnock wins today will the last person to leave Britain please turn out the lights”. By the way, no need to feel sorry for Neil Kinnock. Along with his wife, Glenys, they both landed cushy jobs in Europe and are now firmly ensconced in the House of Lords. And so another entertaining puzzle by Raich, showing how a simple theme can be made into an enjoyable puzzle. My debut Listener – how long have I waited to say that! Indeed this was almost a debut puzzle as it was the third one I set about four years ago. Although I can remember where I was when I set it (I won’t bore you! ), the difficulty now is that I cannot remember why I thought of the puzzle. I don’t think it was based on a Listener puzzle using outlines of places, as I had only been solving for about a year, but I do remember thinking that the outline of Africa could be constructed using the letters of the word. I got an outline of Africa and placed it over a large grid and worked out that it needed to be slightly longer than it was wide and therefore plumped for a 13×12 grid. But how to choose the letters? What if Africa was an odd-one-out. Continents – not enough. Countries – yes, although there are far too many. European countries were the way to go. I sat down with Chambers looking up all possibilties preceding another word, and listed them in length order. Highlighting every occurrence of A F R I and C in each, I could work out a possible symmetrical grid using every down entry. However I soon realized that if I were to use every down entry, I would never make the across entries into real words. There was no point in using only a few down entries, so I went for across jumbles. Luckily the grid could work this way ensuring symmetry. Solvers on the whole are not keen on jumbles, so I wanted to make the clues easier. I thought of cluing these with the wordplay producing the jumbled form. I had never seen this gimmick when I set it, but I have seen it since. I sent the puzzle off to John Grimshaw in December 2008 and never heard any response until Shane came on board when he and Roger discovered several “lost” puzzles. Thankfully the editors decided they would re-solve them (not actually knowing if it had been solved in the first place). Here comes the debate. Solvers on the whole have given positive feedback and so I am pleased it has gone down so well. However, several solvers noticed the connection very early on. I can assure you the comments would have been very different if you had solved the original format. The grid fill was not an issue with the editors, but the denouement proved too difficult with my initial preamble. This merely stated that the solver had to find an odd-one-out, without any extra pointers, which proved to be a stumbling block. I had to agree with the editors that the theme was enjoyable enough without the added difficulty and the extra leap would merit criticism. Talking of editors, I don’t think anything happened to Roger at the end of the Listener dinner (see 20 down) but has anyone seen him since? For the second week running we have a new Listener name, though Shark is familiar in the IQ, EV and Magpie series (one of those rare compilers who can set a numerical puzzle too) and well-known to us for the flawless cluing. Exactly what that meant quickly became clear as the most obvious clues yielded their secrets. ‘To be fed contents of fromage frais (4)’ FARE is ‘to be fed’ in BRB and there were the jumbled letters hiding in ‘fromagE FRAis. ‘Overcharge nursing home initially – it is to be spent in Korea (4)’. That had to be the old CHON, coming from OC + N(ursing) H(ome). What about the lovely ‘Deer beginning to emerge over ridge (4)’ A fine surface reading with ELK + E(merge) ‘over’ or returning to give EKLE – a jumble of KEEL or ridge. There was a fine range of fields of knowledge touched on in these clues, with, of course, the usual Listener compiler’s touch of the hard stuff in ‘Cooks in fine wine – half left (5)’ F + RIES(ling), ‘Practically rush drink (3)’ TEA(r) and the inevitable result in ‘Urine container with unknown disease (3)’ PO + X. A touch of humour there, but not half so racy as the delightful in-joke about our Editor, ‘Roger removed from annual dinner in style (3)’ WAYGOOSE less ‘goose’. All the letters of WAY were confirmed by intersecting ones but it was days after completion that I finally stopped worrying about whether Roger had just gone rather over the top after I last saw him in the bar at about 3 a.m. after the Listener annual dinner. How on earth did Shark find that obscure word for a printer’s annual dinner and spot the possibility for a hilarious (and rather scurrilous) clue? We were thoroughly enjoying this solve as the grid speedily filled, and rather reluctant for it to end too quickly but we must have struck lucky, as the potential adjectives for our first half-dozen solutions established a pattern that was soon confirmed. (That is what I meant about the editors looking for originality – something new); those adjectives. We had FRENCH MUSTARD (yes, we know that ‘MUD’ can be gutters in Scotland), GREEK NOSE, ITALIAN SONNET, SPANISH FLY and RUSSIAN TEA. It was obvious that one adjective was going to stray outside Europe and it just could have been China or Mexican tea, but we held our breath and completed the down clues, and, sure enough, a far better candidate presented itself. AFRICAN VIOLETS! The second pdm quickly followed. We had to highlight ‘all occurrences of letters in the nounal form of this “odd one out” in the grid’. At once a familiar shape appeared and we were struck with amazement at the skill of this compilation. Unobtrusively, Shark had managed to restrict the presence of those letters A F R I C A to the continent’s outline: he left himself just three vowels, E O and U. Now that is mastery! A very high standard is being set here. A solving friend said ‘These clues were of the quality of the early Sabre – and that is no small praise.’ I wonder whether coming crosswords are going to live up to the standard set by this one and last week’s by Ron. Great, Shark!